Parvo virus is one of the deadly viruses that affect dogs. Many numbers of dogs are being affected by this severe virus. This virus is very dangerous and should be treated seriously. What’s tragic than buying a new puppy, it’s getting sick and dying quickly. The virus is very dangerous that it can remain outside of the host even for around five to six months. Most of the other puppies nearer are more likely to get infected. If a puppy or dog dies being affected by the parvo virus, the virus would remain outside the host for many months, the only remedy for saving the new puppies from being affected is to bleach the place the puppy lived in cleanly. The parvo virus does affect the puppies very quickly and everything finishes within a few days. Everything will look normal and things would worsen quickly and suddenly. There are some symptoms from which you can track down the parvo virus. The symptoms are as follows diarrhea, vomit, excessive thirst, lack of appetite, disorientation. Another important symptom is your puppy vomiting regularly; it would be very clear and like phlegm. There’s chance for the abdomen your puppy to tuck of come out. The puppies will be thirsty, go to water but won’t drink water. Don’t try to make it drink milk as it would worsen the diarrhea. Most of the occasions you would find your puppies falling in the water tub due to lack of stamina. You can find lot of changes in his behavior; he won’t greet you as normally. It would simply lie back where ever it is. You can also find him being very lazy and lethargic. As the parvo virus infects the intestine of the dog, the digestion becomes a big problem and would lead to severe appetite loss, making the puppy to grow weaker and weaker. No matter what you do, your puppy will refuse to eat and drink. If these symptoms don’t vanish within a day immediately consult a veterinarian. Mostly the puppies of 2 to 6 months are more often affected by the parvo virus than the dogs, it can also happen to weak dogs. 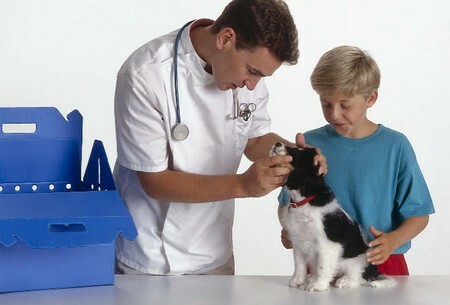 So if you love your puppy vaccinate them in advance and clean him regularly.